The overall workload is evaluated by means of the cumulative set of occupational conditions, the level of physical activity and the level of energy expenditure. Exposure to an increased number of occupational conditions is linked to increased preterm deliveries and, to a lesser extent, to increased small-for-gestational-age births. Increases in the incidence of low-birthweight and high blood pressure during pregnancy are suspected in the presence of two or three occupational conditions. Excessive preterm deliveries and low-birthweights are suspected during exposure to high and moderate levels of physical activity, respectively. 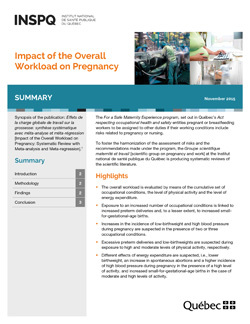 Different effects of energy expenditure are suspected, i.e., lower birthweight, an increase in spontaneous abortions and a higher incidence of high blood pressure during pregnancy in the presence of a high level of activity, and increased small-for-gestational-age births in the case of moderate and high levels of activity.